A game about history that’s fun for the whole family, even if you don’t know your history! 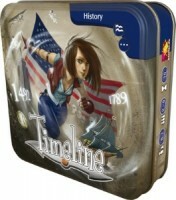 The full review of the Timeline series can be found here. This set plays identically but with a different theme, explained below. So What’s Different About This Timeline? Never one for subterfuge, the Timeline series ventures into America’s past with an edition titled American History. The focus is on events you may recall from the textbooks of your youth (depending on geography). Heavy on Presidential elections, impeachments, wars, assassinations… this is definitely on the “mature” end of the series’ spectrum. Spanning a little over 500 years, from 1492 to 2010, American History has a pretty even distribution of events within its range. For Americans, American History will probably be a little less luck-based than other sets; for non-Americans, likely much more. If history is not of interest to you, American History will not be your favorite of the Timeline titles. Where other sets have a lot of fun little what! moments (like “rubber bands couldn’t have been invented that recently!” or “how could scuba diving possibly date that far back?”), these are mostly absent in American History. Unless it completely blows your mind that George Washington predates Abraham Lincoln. In Timeline: American History, players have hands of cards and take turns attempting to place the cards correctly into the growing timeline. Easy at first, but rapidly growing more difficult, Timeline: American History will test your knowledge and help you learn the history of the nation. The sixth in the popular Timeline series. Add a Review for "Timeline: American History"